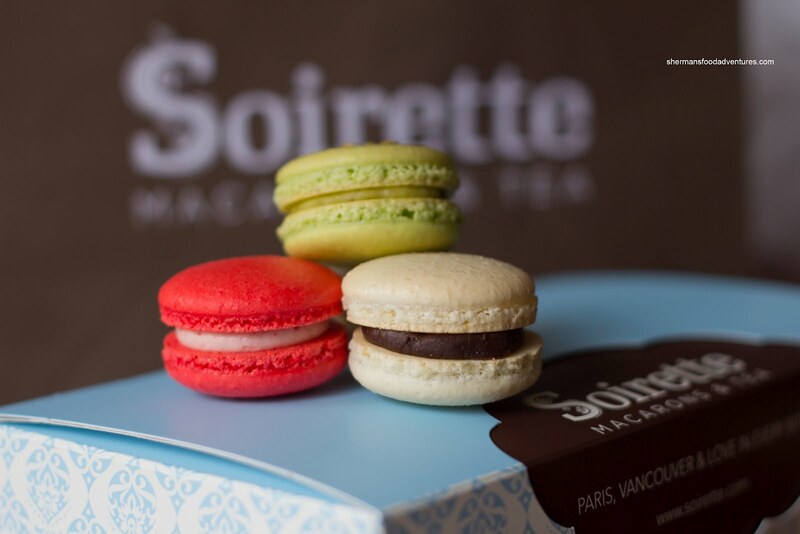 I'm sure it comes to no surprise that the latest food fad to hit Vancouver is the macaron. Don't confuse this with the macaroons you see in the boxes of Neilsons (those are toasted coconut chocolate treats) for around a dollar at Walmart. Rather, the macaron is a French import consisting of a meringue almond powder "cookie" sandwiching a filling of some sort. Despite the vibrant colours, the meringue part of a macaron generally is not flavoured. That is reserved for the filling. In terms of appearance, there needs to be a uniform shape and size with the obligatory "feet" (rough edges around the base of the meringue). Okay, I can go on and on about the macaron, but I'll stop here. As mentioned, it has become quite popular here in the past couple of years. You can find them at places such as Thomas Haas, Thierry and Kitchening with Carley to name a few. 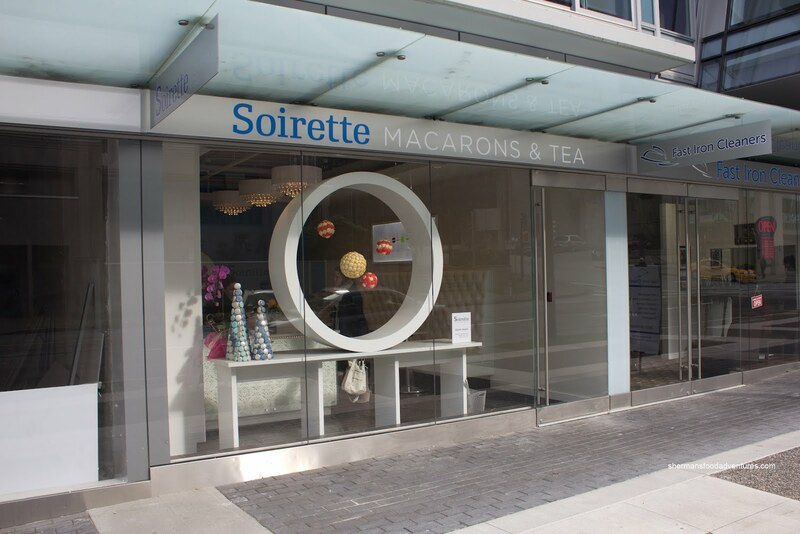 Now we can add the newest entry, Soirette, to the mix. As you might already know, I'm not a huge sweets person. However, I am a sucker for macarons. They just look so darn cute. Did I just say cute??? I meant manly. Wait... Nevermind. Anyways, Rich Guy and I decided to hit up Soirette after Dim Sum. Its location is in a somewhat quieter part of Downtown near Coal Harbour. The place is simplistic, elegant and focused. They only serve macarons and tea folks - a good thing when you want to specialize in one thing. On the day we went, there were 17 flavours to choose from. 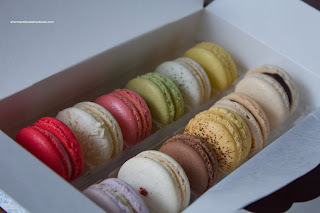 I decided on a box of 12 and just in case you were wondering what they were, starting from the bottom left clockwise: Raspberry, Malibu, Rose, Pistachio, Matcha, Lemon, Caramel Fleur de Sel, Cappucino, Passionfruit, Chocolate, Pink Peppercorn and Lavender. For me, the highlights were the pistachio, chocolate, caramel fleur de sel and pink peppercorn. I though the texture of the macarons were bang on being crispy and delicate. The flavours were very real while not being too sweet. For example, the pistachio really tasted like pistachio without any hint of "artificialness". For me, these are legit and would be immediately in my top 3 in Vancouver. Dare I even say the best? 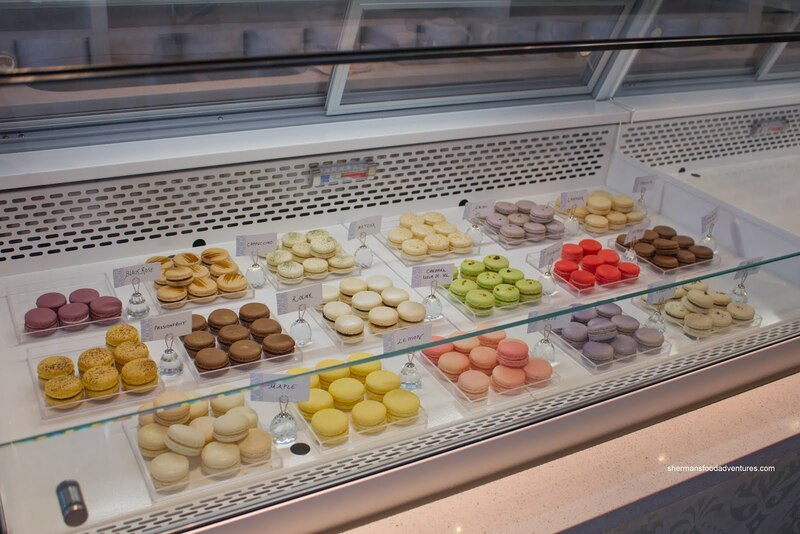 My latest macaron bakery discovery is French Made Bakery on Kingsway and Broadway. Have you had a chance to try these yet? They are absolutely divine and give Le Panier in Seattle a run for it's money. Also, their almond croissant is to die for. I haven't tried this place yet. Maybe my next macaron craving?